Reverend Peter Rickman with the St Paul’s students who completed the 40 hours of service. A group of St Paul’s Collegiate School and Waikato Diocesan School for Girls students have been recognised for their outstanding contribution to the 2018 40 Hour Famine. The students have been awarded ‘best 40 hour event’ in the North Island by World Vision New Zealand and will be presented with the award at the 40 Hour Famine Awards evening on September 6 in Auckland. In June, the students took part in 40 hours of community service to raise money for the 40 Hour Famine. 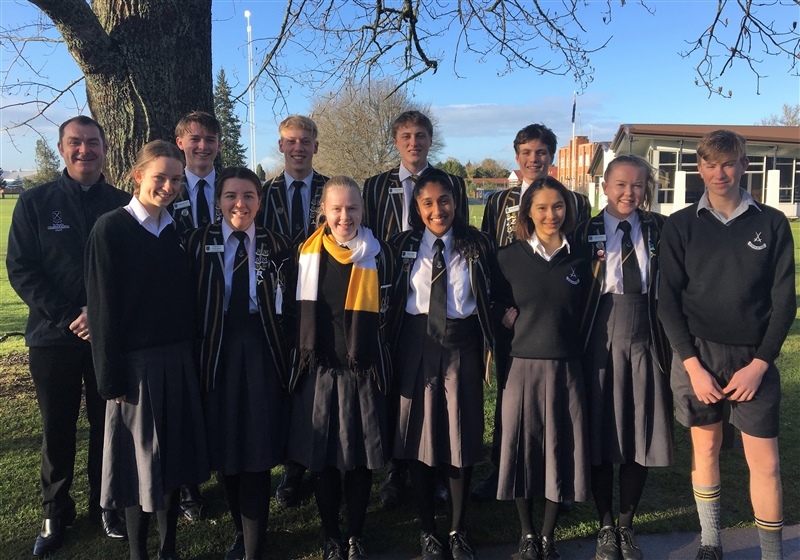 Projects included singing at St Joans rest home, preparing and serving meals for the homeless at The Serve Trust, landscaping alongside The Fairfield Project and assisting staff at Waikato Hospital with moving patients into chapel for Sunday service. In total, they raised just over $5500. “All the students involved committed themselves wholeheartedly to this task and were transformed by the experience. We are particularly appreciative of the local agencies and projects that supported us and gave us this opportunity to join with them as they each provide an incredible service to our city,” he says. The 40 Hour Famine Awards highlight the local and global impact of this year’s famine as well as acknowledge the outstanding leadership and fundraising efforts of students, teachers, principals, schools, churches and community groups. The 2018 40 Hour Famine saw nearly 100,000 young New Zealanders standing united with the children of South Sudan. “We are incredibly encouraged by the commitment Aotearoa’s young people have shown to a global movement that’s helping combat poverty and injustice in the developing world,” says World Vision Senior Schools Partnership Manager, Harley Hamilton. “With the St Paul’s and Waikato Dio initiative, we were really impressed with their ‘here and there’ concept – helping communities in need not just overseas, but within their own community of Hamilton as well. Their dedication has been invaluable in helping World Vision to raise awareness among this generation of the need for social change,” he says. The students involved were Genevieve Scott-Jones, Heath Johnson, Sam McClay, Alice Emeny, Priya Singh, Daniel Rickman, Harry Forte, Hassen Kadhem, Siobhan Read, Cameron Coull, Elliot Leighton-Slater, Jana Stokes (all from St Paul’s), Sarah Booth, Emily Wakelin, Jasmine Singh-Ark, Charlotte Grey, Emily Irvine, Teri MacDonald, Mei-Lin Chew, Eva Kessles, Sofia Kent and Blanche Herbert (all from Waikato Diocesan).